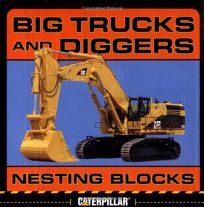 An inspired addition to the Nesting Blocks line, Big Trucks and Diggers Nesting Blocks by Caterpillar will thrill budding builders. Ten rugged cardboard blocks each feature a numbered black-and-yellow road sign on one side, a photo of a construction vehicle (""excavator"") on another, an illustration of same machine with a note about what it does (""digs and moves""), a drawing of a tool (""jackhammer"") plus a skyscraper that grows taller as the blocks are stacked. All fit into a built-to-last carrying case with a bright yellow cord for easy transport.